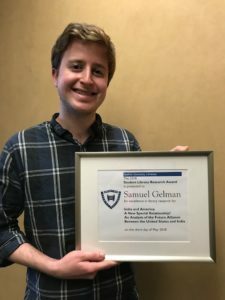 Please join us in congratulating Samuel Gelman, a third year Yeshiva College political science major. For Professor Maria Zaitseva’s class, Writing Politics, he researched and wrote “India and America, A New Special Relationship: An Analysis of the Future Alliance between the United States and India.” The award recognizes excellence in research through the use of the University Libraries. A team of seven librarians reviewed 27 entries.